Eddie Kirkwood is the litter picker who inspired Britain. It was last month that we first reported how he spends eight hours a day, seven days a week, volunteering to clean up his city. And that he's been doing this for the last eight years - clocking up a total of more than 20,000 hours of time spent picking up litter. All without pay, and with very little thanks in return. We saw how he overcomes the physical challenge of his cerebral palsy to go out in all weathers - all year-round - picking up litter from his wheelchair. And yet Eddie denied he was any kind of local hero, saying he was "just an ordinary person trying to make his city a better place for everyone". Eddie describes himself as 'just a normal person'. But other people saw it differently. They saw Eddie - with his great attitude and a love for his own community - trying to do whatever he could with everything he has to make the world that little bit better. Within a matter of days, Eddie's story was being shared around the world - including by celebrities like JK Rowling - and viewed by millions who were moved by this 'one man band' who never stops smiling. "People stop to speak to me and thank me wherever I go out litter picking now," he says. "I've even had a few autograph requests! It's overwhelming, but I want to say thank you to everyone who's taken the time to speak to me. I really feel appreciated." The 28-year-old is now regularly recognised out and about. Many of those inspired by Eddie's work wanted to do something in return to help him. Given Eddie had already signed up to complete the Santa Dash 5k fun-run in Glasgow, a campaign was started online to support his fundraising efforts. "It was amazing," Eddie says. "Donations started in from around the UK and I even got one from Singapore. My favourite football team, Rangers, have a charity foundation and they donated £1,000. "I was just so happy to see I had made an impact on people." 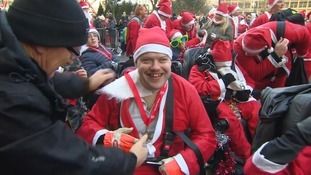 Eddie completed the Santa Dash in freezing temperatures, dressed as Santa Claus, raising almost £5,000. That, combined with the money raised by his team-mates in his Glasgow Gladiators power chair football club, was enough to buy a new chair for the club and secure funding to keep them going for another year. Eddie raised almost £5,000 doing a 5k Santa Dash. But Eddie isn't taking the new chair for himself - he wants it to be used by anyone who is thinking of joining the club, meaning another person with a disability can join in. "People should know how hard it is for people with disabilities to join in sports like this," Eddie tells me. "It's expensive and if you can't afford a chair you might have to stay at home playing your computer on your own." I ask Eddie if he thinks enough is done to include people with disabilities in society. "No. And being isolated can be very, very depressing." So what difference will this chair make to someone's life? "It'll make them feel alive again. Alive and kicking, so to speak!" There's a new wheelchair ready for a new member of Eddie's club. Eddie still goes out to clean his city every day, and it wasn't just money people donated to help him. "I was sent a hi-vis backpack that fits onto my chair when I'm out litter picking which means I can do it after dark. I want to say a big thank you for that. People have been so generous." But Eddie is not resting on his laurels and has already set his sights on his next challenge. "I am going to climb a mountain. I want to do it, and I will climb a mountain. I will! You have to believe in yourself - miracles can happen, you know!"